Days: September 8-9, 2017 NOTE: this event has already happened, find current-year events on the events page. 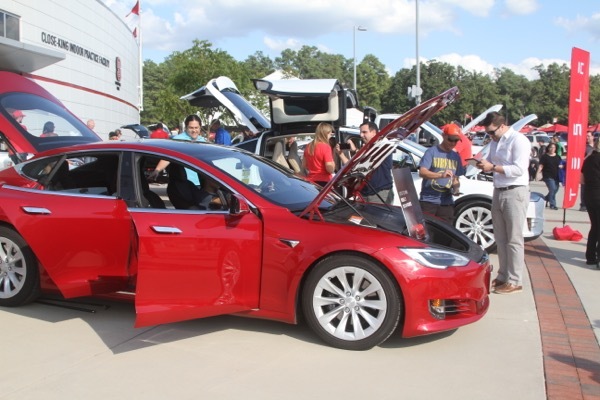 The event was over 2-days with a driver meet-up and ride & drive with dealer vehicles on Friday and vehicle show on Saturday at the NC State Football home opener. Vehicle line-up was outstanding with 37 vehicles between the owners and dealers on Friday and 16 on display for Saturday. The Tesla Models S and X, and the BMW I8 were big hits and got the most attention. The car show at the football game was a winner. An estimated 1,000 people walked through the display area and received information with an additional estimated 6,000 to 8,000 that walked by on their way into the game. We had a couple of EV owners help out on Saturday and they were the best spokespersons that we could have had. My big take away was that the public is very uniformed with regard to plug-in vehicles. I had several that after talking with them for a few minutes had their opinion on a plug-in vehicle go from absolutely no way to it could work and was a possibility. NC Plug-In Vehicle Owners and Friends, please join the NC Clean Energy Technology Center in kicking off Drive Electric Week with an alternative fuel vehicle demonstration and tailgate at NC State University’s 2017 football home opener versus Marshall University. Plug-in electric vehicles will be showcased. There will be a ride & drive and plug-in vehicle owner meet-up on Friday afternoon, September 08, followed by dinner (Mediterranean catered by Jasmin). The ride & drive and dinner are for invited guests only, with r.s.v.p required. All are welcome to come see the ride & drive vehicles. Please bring your plug-in vehicle for a plug-in driver meet-up and car show on Friday. The driver meet-up and car show is open to the public. For game day, there will be a public alternative fuel vehicle show and invite only tailgate (Barbecue catered by Kaplin). Both events will be held outside the new Close-King Indoor Practice Facility next to Carter-Finley Stadium. There is an opportunity to purchase tickets that include dinner on Friday, and the tailgate and game on Saturday. A two ticket game package with parking pass cost is $210 and a four ticket game package with parking pass cost is $400. Seats are limited. Order deadline is Friday, September 01, 2017 at noon. Confirmed Ride & Drive and Show Vehicles from Ford, Chevrolet, Nissan, Tesla, BMW, Toyota, Porsche, Zero Motor Cycles, and Polaris GEM. For the plug-in vehicle owner meet-up and car show on Friday, September 8th, please register at the National Drive Electric Week (URL: https://driveelectricweek.org/event.php?eventid=1076). For the dinner on Friday, September 8th, and tailgate and game tickets on September 9th, please go to NC CETC Store Front site (URL: https://commerce.cashnet.com/NCSUNCETC?ITEMCODE=NCETC-NCSFBL) or contact Rick Sapienza at the NC Clean Energy Technology Center at 919-515-2788 or resapienza@ncsu.edu. A two ticket game package with parking pass cost is $210 and a four ticket game package with parking pass cost is $400. Seats are limited. Order deadline is Friday, September 01, 2017 at noon. Registered attendees report 375,449 electric miles driven.